“ceilings” is the debut production by new dance theatre collective Not Sold Separately. 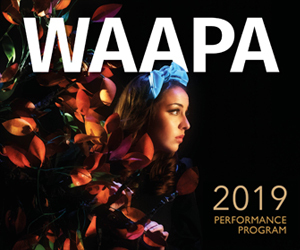 Spearheaded by recent WAAPA dance graduates Olivia Hendry and Briannah Davis, this duo’s venture follows in the wake of various other independent collectives recently added to Perth’s busy contemporary dance and theatre scene. What sets these young dance makers apart from others in the pack is their resolve to self-produce and present a raw, challenging dance programme in an off-the-track theatre space, outside of Perth’s peak performance season (Perth Festival and Fringe World time). The brains and brawn required to successfully pull-off such a professional production is already a noteworthy achievement. As a double bill of mid-length dance theatre pieces, “ceilings” appears to hinge on the experiences and politics of being a young woman in today’s world. In this way, both works seem deeply personal and signal this collective’s gutsy and honest approach to performance. 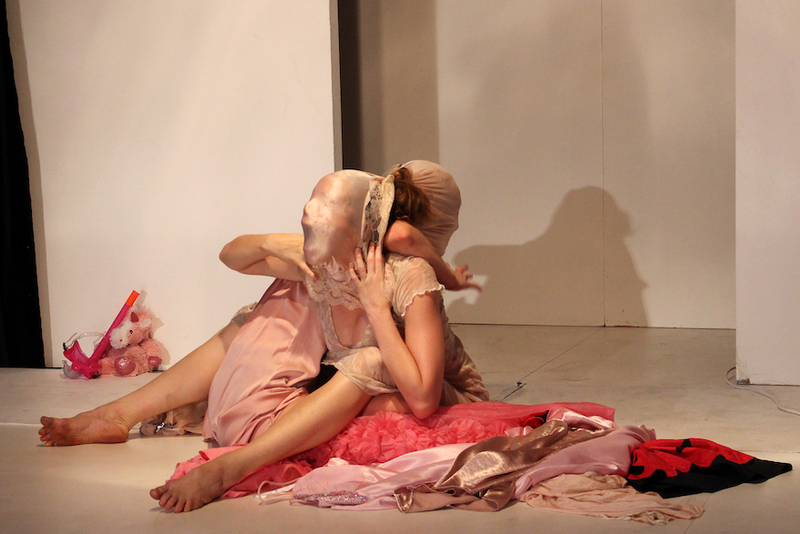 The first work, Bloom, is directed by Briannah Davis, and features four female dancer-performers Jessie Camilleri-Seeber, Jocelyn Eddie, Olivia Hendry, Georgia Smith. It opens with a scene in which a young woman (Camilleri-Seeber) lies motionless (perhaps dead? ), on the floor, in silence. She is attended to by another young woman (Eddie) who kneels beside her, gently “washing” her body with a small spray bottle and cloth. Conducted in silence, this prolonged introduction is a clever way to both focus and unnerve the audience. As we watch the repeated actions of this quiet purification process, we are compelled to closely consider this young woman’s fate. Then, as the attendant cleanser eventually breaks the silence, we listen to her deliver some beautiful prose that describes in detail the process of seeds becoming flowers, and the power and self-sufficiency of the seed itself – in its containing of everything needed for the oncoming life of the plant. This text, for me, is the key motif of this work. As the other dancers join the stage and move through a series of choreographic and text-based scenes which frame the young women as both strong and vulnerable, it seems that this seed and flower analogy holds the key to it all. The strongest parts of this work are those that use dance alone to explore these complex states of being and becoming, with some of the other purely text-based scenes losing the subtleties of the opening. With further development and research, these ideas of the female “becoming” could be communicated with greater clarity and resolve. Lilly King and Ana Music in ‘No Mandarin’s an Island’. Photo: Minni Karamfiles. In the second piece, No Mandarin’s an Island by Olivia Hendry, there are similar strengths and weaknesses. Hendry has chosen five female dancers (Jessie Camilleri-Seeber, Jocelyn Eddie, Lilly King, Briannah Davis and Ana Music) to portray her wonderfully pink vision of women’s experiences of solidarity and separateness. Instead of the flower, Hendry uses water as her central theme. From here, she creates analogies of “swimming without sinking”, “the struggle to come up for breath”, and “speed-swimming towards the winner’s prize”. Again, these poetic motifs are ripe for further exploration, and with more time spent in development they could be directed to more resolved ends. Overall, this double bill revealed not only the active minds, but the deeply felt performance qualities of these young female artists. The ensemble dance sequences of both pieces were particularly enjoyable to watch, in their reflection of the artists’ imaginative choreography and their sensitive interpretations by the dancers. For this audience member, the show marked both the beginning and the continuation of a bevy of sharp artistic intentions, and their sharing of these ideas in motion, with us, was a very generous offer. Pictured top is Georgia Smith (front), with (L-R) Olivia Hendry, Jessie Camilleri-Seeber and Jocelyn Eddie, in ‘Bloom’. Photo: Minni Karamfiles.